I don’t need to tell you how divided our country has become. How polarized. How there seem to be two different Americas today, each living in a parallel but very different reality from the other. How people feel free to spout the most vile language, to dehumanize their neighbor, and to throw away the very values of America while claiming to cherish them. There was a day, not so very long ago, where we truly were the United States of America. I hope someday we can find ourselves there again—but united in joy, not grief. Death flew out of the clear blue sky. In Manhattan, papers and people fell like rain. In Washington, the Pentagon crumbled. In a Pennsylvania field, a plane of heroes crashed. And still the Towers stood. They stood in defiance of hatred. A domino effect of death. But still the Towers stood. No African-American, Asian-American, European-American, Native-American. United in anger and pain. This week I am taking the week off. My daughter is finally done school, so we are hanging out and relaxing for a bit. I’ll be back next week, as usual! Meanwhile, enjoy the view. What motivates you to do things? Sometimes it is as mundane as necessity, other times it might be a higher ideal like justice. Every single thing we do in our daily lives has a motivation behind it. Which leads to our characters—everything they do must have motivation pushing them. Some motivations go without saying: someone who is eating is probably hungry, for instance. But an unusual action needs explanation. Why does someone run into a burning building to save someone? Why does someone pay for a stranger’s meal in a restaurant? Those are the motivations readers want to understand. The same situation will prompt different reactions from different characters. If they find $100 on the street, one might try to find the owner, one might immediately pocket it, and a third might donate it to charity. Their reactions will show the reader what these characters are like at a deeper level—and give a clue to what motivates them. The overarching motivation for a character should be consistent. Most people are driven by a deep belief that rarely changes. A person is not going to give money to a homeless person one day and kick him the next—and if he does, then that’s a story in itself. A consistent motivation will help ground your character, and therefore your readers. Of course, many stories are about character change, and as a character changes, what motivates him or her might change, too. A self-absorbed career man motivated by ambition might put ambition aside after having a child, becoming motivated by his love for his child. As their guiding belief changes, their motivation can change, too. If your characters’ motivations are going to shift from the consistency they had in the beginning of the story, then be sure to let the reader in on the change as it happens. Take them on the journey, let them live the experiences that change your character. That is, after all, the story—and that’s why the readers came. 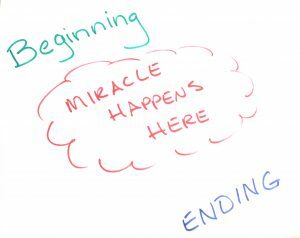 For many readers, the question that keeps them turning the page is not only “what happens next”—but “why”. Why your character does what they do can fascinate the readers as much as what they are doing. So when you think about your character, think about the “why”—the motivation. Do you consciously consider character motivation, or does it just flow naturally for you? 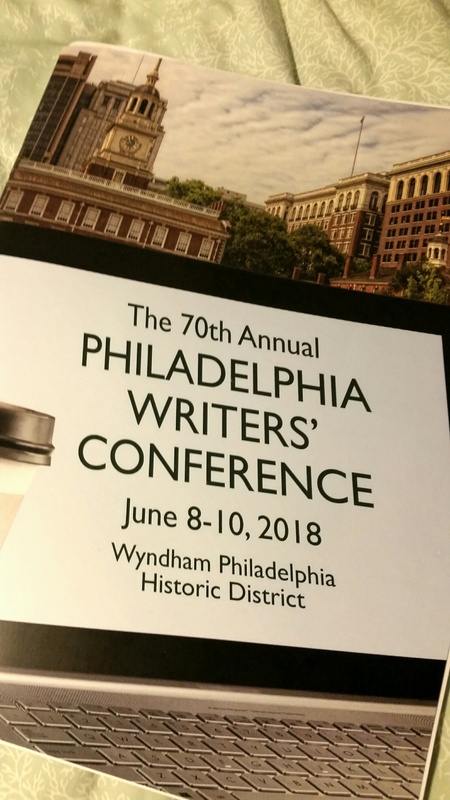 This year’s Philadelphia Writers’ Conference filled my head with new and exciting information, leaving me both exhausted and exhilarated. Now that I have had a few days to let all the swirling ideas settle, one of the main things that stuck with me is the complexity of our craft. I’m not talking about plot complexity. Even the simplest story is complex in the way I mean. What I mean is how every element of your story impacts the others. In our character workshops, we also crossed into plot. In our plot workshop we also delved into character. Every word choice and point of view feeds into the elusive element of voice. Everything interconnects, playing off each other and driving the story in different ways. That same complex interconnection often makes revision a mind-bending project. Change one thing about a character, that can change the plot. Change POV, and your voice skews. Change the language and that might suggest a change in structure. Every change, no matter how minor, flows downstream all the way to the end of the novel. Riding those rapids can exhaust you. This complexity of story comes from the fact that stories reflect the complexity of life. This helps stories translate across different media. The same story can be told orally, in print, in graphic novels, or on a screen large or small. Although the formats differ, the story fabric can be cut and tailored to each one to convey the same meaning and soul as the original story. The interwoven complexity of story gives it both strength and malleability. Given the complex nature of writing and all its elements, is it any wonder that the craft of writing is so hard? The work of weaving a tale can take an emotional, psychological, and even physical toll on writers. To combat this, we need connectivity of our own—a network of friends and supporters who understand and can help lift us over the obstacles we encounter. 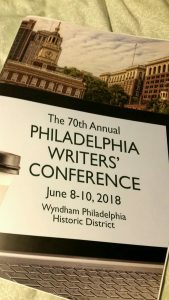 This is one of the values of conferences like the Philadelphia Writers’ Conference. There we meet and connect with other writers and form bonds that last. Thank you, PWC, for 70 years of helping writers connect so we can weave our stories together. In writing, we talk about pantsers vs. plotters. A pantser writes with only a basic idea of where they are going, while a plotter makes a detailed plan before they even start writing. I am somewhere in between, making me a “plantser”. I usually know the beginning, end, and several important plot points in between, but not exactly how I will get from point to point. 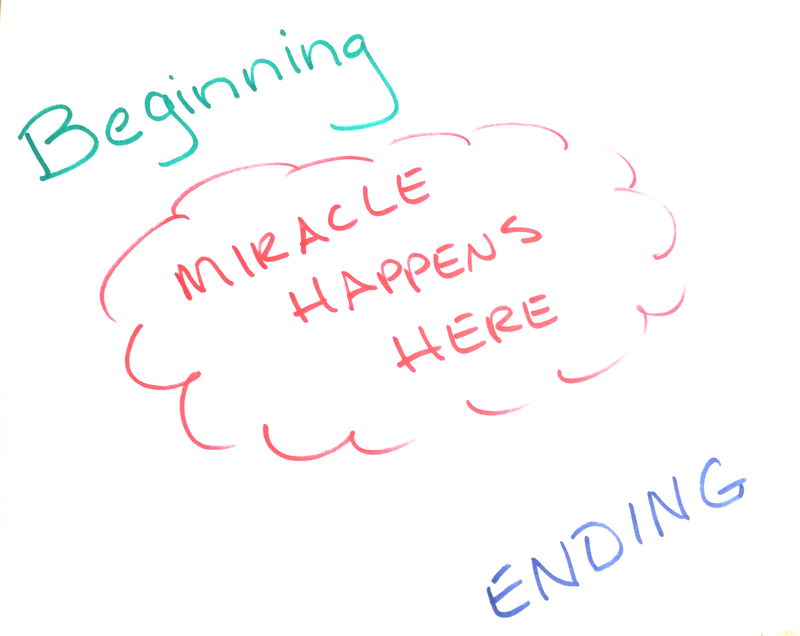 My old writing partner used to refer to my middle section as “miracle happens here”. I got to wondering if writers follow the same organizational scheme for life as they do for their writing. Do pantsers just go with the flow, while plotters make a detailed To-do list for their life? This question came to mind because I am in a place in life where I feel I really need to make time to sit down and plan out certain things. I need to start a meal plan if I want to eat better. A marketing plan for when I re-release my book. A blog plan to focus what I write about. I know that if I get these plans in place, I will follow them, because I follow plans well. But I haven’t brought myself to actually do the lists yet. Is this because of the same creative process that makes me a plantser? Or is it a form of procrastination because I really don’t want to do these things? So what say you, fellow scribners? Do you find you plot or pants your way through life, according to your creative process style? This is getting somewhat ridiculous. 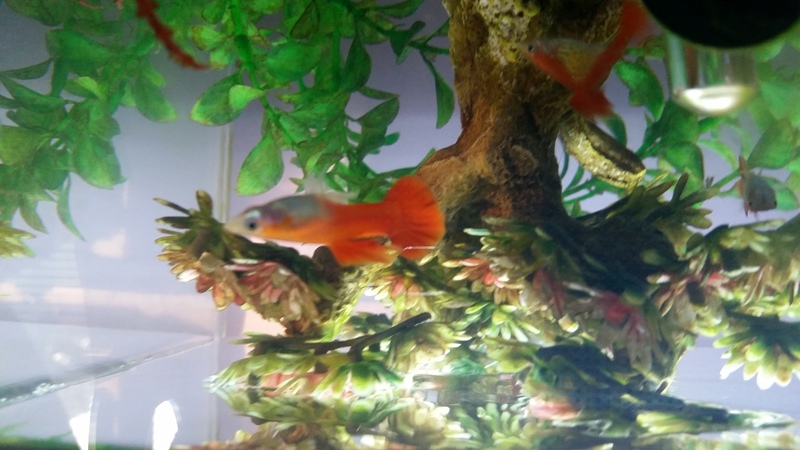 I just wrote about the 2 new fish we got last Monday. All three fish—Seashell 3, Glimmer, and MiniSeashell—lived happily together. No fighting, often swimming about in a calm group. All was right with the world. And then today Seashell died. Of what, I don’t know. He had no marks on him from fighting or an attack. I went in to clean the tank, saw the 2 new fish swimming and asked them gaily, “Where’s Seashell?” because he was always up in front. And then my eye found his glassy one. He was indeed up in front, but upside down at the bottom of the tank. Just this morning, Seashell 3 had been zooming around the tank with the others, eating heartily. What happened? I usually check on the fish several times a day, but today I did not, so I can’t even narrow down when it happened. Sometime after 8 AM but before 5:15 PM is the closest I can get. I feel a bit guilty that I didn’t check on them more frequently today. Not that it would have changed anything (I mean, even if he looked sick there’d be nothing I could do), but I still feel that “what if” feeling. So now my daughter is going to come home from a nice outing with her father to find her fish is dead. I don’t know how she will take it. The others lived with us almost a year, and were clearly ill. Seashell 3 was only with us 5 months. 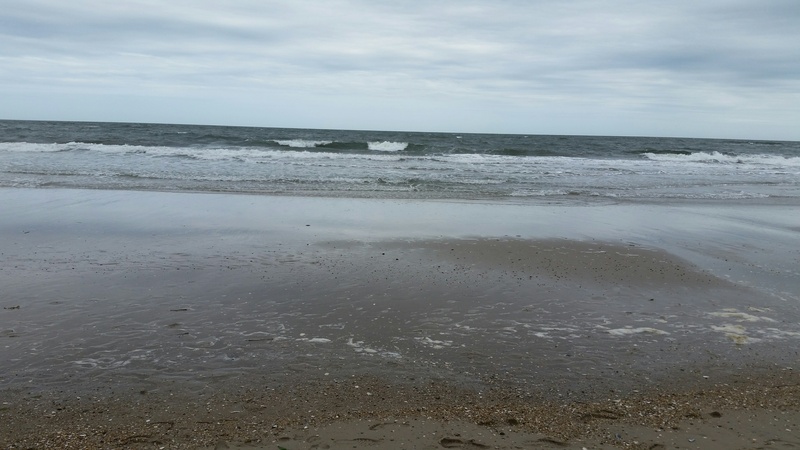 RIP Seashell 3–a calm, good-natured fish. He put up with Gem’s ferocious attacks when we first got him, and slowly Gem came to accept him. Seashell 3 ruled the tank with his new tank mates for almost two weeks, but was never a tyrant. 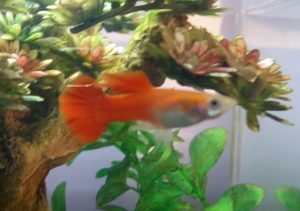 His sudden death was shocking, and Young Owner will miss her fish very much. When last we spoke, we were saying goodbye to Gem, our longest-lived fish from the original batch. We didn’t want Seashell to get too lonely or spend too much time alone in the tank, so on Monday we went out and Young Owner got two more fish—#7 & #8. She named them Glimmer and MiniSeashell. She named the more orangy one Glimmer because of the way the sun shone off his body when we were driving home. And MiniSeashell is patterned like Seashell, but he is very tiny. He is also much paler than the other two. I am worried he is sickly, but Young Owner is hopeful he is just young. Seashell took to his new tank mates much better than Gem did. There has been no vicious attacking, just some flaring fins and chasing around the tank. Perhaps because there are two new fish, so he can’t focus on one. Or perhaps because he didn’t spend almost a month alone like Gem did. Or maybe Seashell was just happy to have company—he had looked a bit forlorn all alone in the tank. Much of the day I see the three swimming around rather leisurely, and the chasing seems more playful than predatory. The New Trio (from top): Glimmer, MiniSeashell, and Seashell 3. MiniSeashell has already given me several heart attacks when I have turned on the light to find him on the bottom of the tank. The very first morning, I couldn’t even see him breathing. Several minutes passed before I saw an eye twitch, and a few more before the other 2 fish swam down to him—and suddenly he was swimming with them! I hope he survives and thrives in our tank. *Seashell 3 died unexpectedly on May 30th. Cause of death unknown. 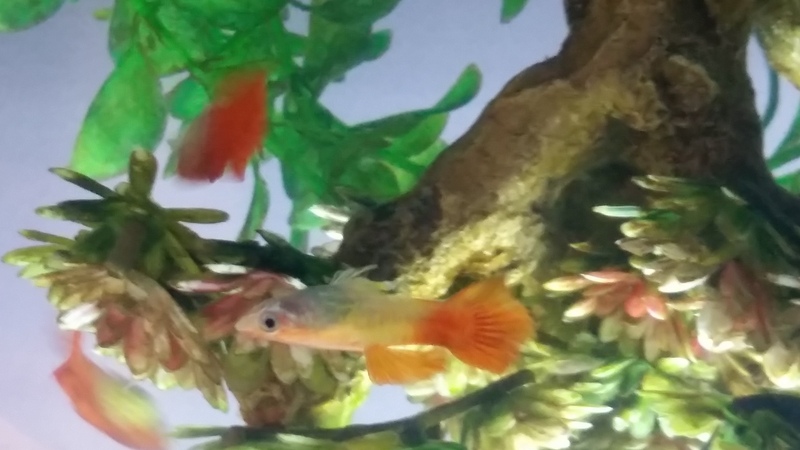 We’ve had fish for almost 15 months now. Not the SAME fish, mind you. We started with 2 fish. We lost our first fish the very first night. We bought 3 more. Then we lost the second fish a few weeks later. Then things quieted down for a bit until we lost 2 more within a couple of days in December 2017. Then there was only one—Gem. 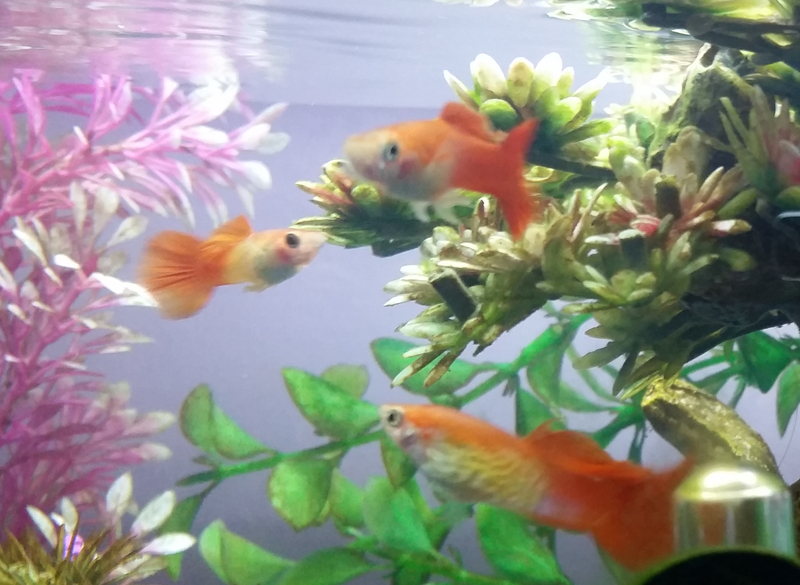 We got him a friend in January, and after a fraught beginning the two fish settled in contentedly. Unfortunately, Gem was not to enjoy tank life for much longer. 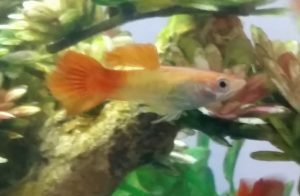 At 16 months of age, he was getting old for a male guppy, and he succumbed to what I believe was the same type of internal tumor his tank mate Flower had died of in December, although Gem did not suffer and went quickly. RIP Gem. Sometime overnight, our fish Gem passed away. 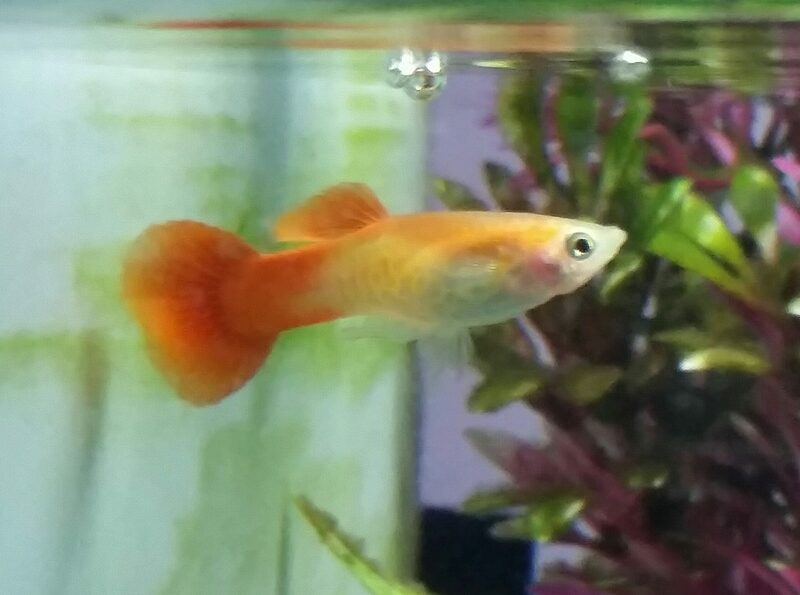 Gem was the sole survivor of our first batch of 5 fish. He was the smallest, with a distinctive narrow torpedo body. He was also the peacemaker, literally putting himself between the bully fish and the ones being hassled. The Ammonia Scare of 2017 left him listless for several days, and we did not expect him to make it, but then he came roaring back. 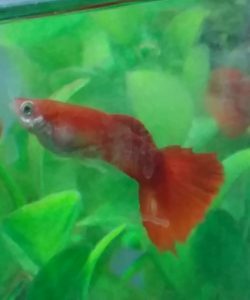 He survived the several rounds of fin rot, that eventually took one of his tank mates, with nothing worse than a white streak on his tail. When tank mate Flower slowly succumbed to an internal tumor, Gem could be found at his friend’s side most of the time. When we got Gem a new friend, he was not very friendly at first, but after a few days he calmed down and reverted to his more laid-back personality. Gem seems to have had the same sort of internal tumor Flower had, but he only had noticeable symptoms for a week, and was active much of the time up until yesterday, when he did not eat and stayed on the tank floor much of the day. Not even his friend Seashell 3 could entice him to chase him. So when Young Owner could not find Gem this morning, we knew what had happened. We found Gem hidden under a seashell in a corner. Young Owner said goodbye to her favorite fish and we sent Gem off to the ocean. Gem has now joined Seashell 1, Sparkleshine, Seashell 2, and Flower in Fish Heaven, leaving Seashell 3 as sole survivor. We plan to get Seashell 3 a couple of new friends as soon as time permits a run to the fish store. 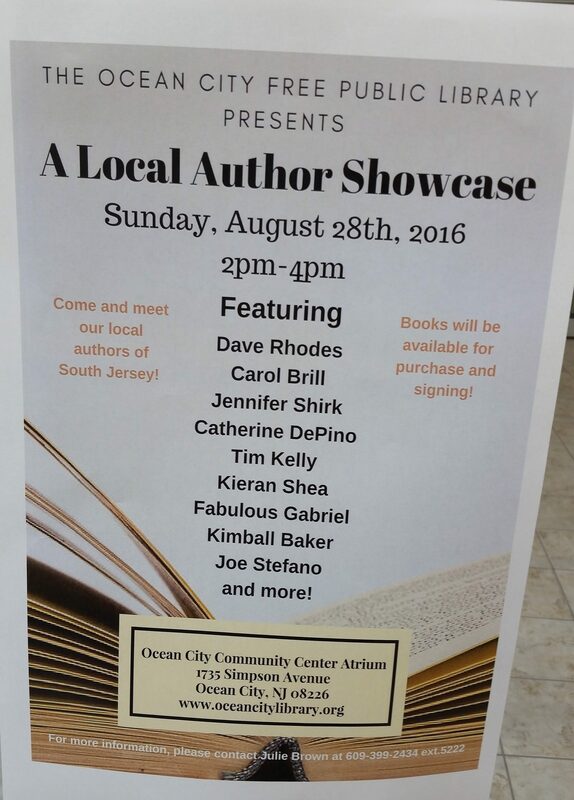 Today is the Ocean City (NJ) Public Library’s Local Author Showcase. I attended the inaugural event two years ago. We had a good time in 2016. I mean, it’s a day at the shore, how could it be bad? My husband and daughter came, too. They spent the day on the beach. 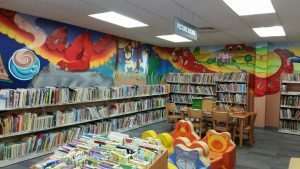 The inaugural event went well, but this year the library wanted to see if they could increase the foot traffic. Last time, it was a beautiful summer day. Even book lovers didn’t want to give up beach time for our showcase! So this year they are trying a week day evening. More people are likely to be off the beach, going to and from dinner, and looking for ways to spend the evening. Hopefully we’ll get a larger crowd. I’m looking forward to the event. Hanging with other authors is always entertaining, and I look forward to chatting to any community members who come by. If you’re in or near Ocean City tonight, stop by the library from 4-8 pm! When I was a kid, one of the things I liked about snow days was how they felt removed from everyday life. As an adult, they do not have quite the same appeal, LOL. However, sick days with my child have that same time-stopping, reality-removing quality. My daughter stayed home from school Monday and Tuesday, recovering from strep throat, which flared up on Sunday. Needless to say, I completely lost track of what day of the week it was. When you are caring for a sick child, it really doesn’t matter what day of the week it is—you measure your time in her improvement or lack thereof. The onset of illness is nightfall, and the return to health is the dawn. Night can last hours or days. Sunday night was rough—she woke me up at 3:30 AM and we were up ever since. So Monday morning slipped in slowly, and I totally forgot to call her out of school until almost 9:30 AM. We whiled away the sick days completely detached from the clock. We ate when hungry, we played some games, I read her some books, and she got more TV and video time than normal. The days had the same cocooned feeling of a snow day, with the outside world held at bay. When your child is sick, the minutes seem to elongate into hours in the dark as you hold your child. She whimpers, cries. Whispers, “Help me.” But you can’t because have given her all the medicines there are and now it’s up to her body. Even though she is infecting you with her illness you cuddle her close, because she just wants her mommy. You want desperately to douse the heat radiating from her body, suction the strangling mucus from her nose and throat, and ice the pain stabbing her throat. But all you can do is hug her and wait for the dawn. The dawn comes slowly, over the course of several days where you get no work done, even when you work from home. Days spent in comforting, cuddling, and caring for your slowly reviving child. The energy, the motion, and the smile—that brilliant sunshine smile—return little by little, signaling her return to health. And even though time and work have vanished—forever irretrievable—into those sick days, you don’t care. Because you know people whose children didn’t get well, whose smile never returned. And gratitude that your child is again noisy and messy negates anything lost in the cocoon of those sick days.